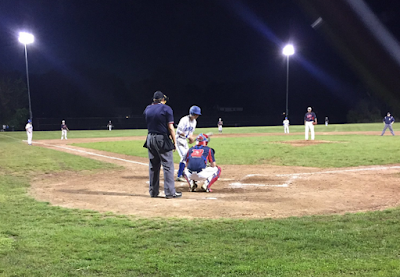 METHUEN - Central Catholic may have missed out on the first three years of the Division 1A “Super Eight” tournament, but if Tuesday night is any indication, the Raiders have the makeup to go on a deep run. All season long the Raiders stronghold has been their starting staff and that was no different on Tuesday night as behind a complete game from Sam Lara, Central Catholic defeated Merrimack Valley Conference Rival Methuen, 6-2, in front a packed house at Methuen High School. Lara threw 102 pitches in the complete game effort giving up two earned runs on eight hits while walking two and fanning seven. Methuen (13-3, 11-3) had opportunities all evening long against Lara, but the Raiders (13-2, 11-1) ace stood tall against each challenge the Ranger’s lineup posed to him. That was never more evident than in the bottom of the seventh when with Central Catholic holding on to the 6-2 lead, Methuen loaded the bases with one man down. The Raiders ace proved why he is one of the best in all of Massachusetts in the game’s most pivotal moment, however, as Lara got a strikeout via his curveball before inducing a fielder’s choice groundout to preserve the victory. Central Catholic coach Marc Pelletier said that the game was always Lara’s to lose. Methuen, in turn, threw their ace in Jacob O’Shea (CG, 6 R, 1 ER, 9 H), and while O’Shea’s night overall was effective, the Raiders were able to get to him early. With one out and nobody on Noah Lucier walked and Keegan doubled to give the Raiders two runners in scoring position. Three batters later with the bases loaded and two men down Mike Lefebre hit a chopper to shortstop that seemed to be the third out of the inning. The ball, however, was fumbled allowing everyone to advance including Lucier who came home with the first run of the game. Moments later Sean Thompson made sure the Raiders came away with more than just one run, as he belted a high fastball into the right center field gap for a two run double that brought home Keegan and Sam Hajjar. Lefebre took a wide turn around third that gave Methuen an opportunity to catch him diving back into the bag. The cut off throw, however, went wide of third base and out of play, which allowed Lefebre and Thompson to both come around to score giving Central Catholic a 5-0 lead. O’Shea only surrendered one run on six hits the rest of the way, but the damage had been done. Methuen chipped away at Central Catholic’s 5-0 advantage, scoring a run in the bottom of the first inning on a double steal and another in the bottom of the fifth on a Owen Foote sacrifice fly that cut the Raiders lead to 5-2 after five innings. Lara, however, stranded eight Ranger base runners in total preventing Methuen from drawing any closer. Central Catholic added an insurance run in the top of the seventh as Lucier singled, Keegan cracked his second double of the day, and Lefebre hit an RBI single up the middle to give Lara and the Raiders a 6-2 lead heading into the bottom of the seventh.